Toyota has said it will suspend sales of eight of its most popular US models after recalling 2.3 million cars last week over faulty accelerator pedals. The carmaker also said it would temporarily halt production of some models at some US plants at the beginning of February. "This action is necessary until a remedy is finalised," it explained. Last October, Toyota recalled 4.2 million cars in the US because of pedals getting lodged under floor mats. 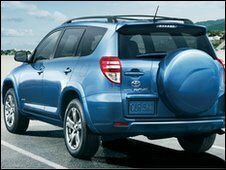 The sales suspension includes the 2007-2010 Camry and Tundra; the 2009-2010 RAV4, Corolla and Matrix; the 2005-2010 Avalon; the 2010 Highlander; and the 2008-2010 Sequoia. Shares in the carmaker fell 4.3% on Japan's Nikkei index after the announcement. Suspending sales of eight popular models is a big risk for the world's biggest carmaker, analysts said. "The recall itself won't be a big problem for Toyota's earnings, but suspending production and sales could have a big impact, depending on how long it lasts," said Koji Endo, auto analyst at Advanced Research Japan. Jessica Caldwell at Edmunds.com said: "In this highly competitive market, no automaker, not even Toyota, can afford to stop selling its cars and trucks for long, but perhaps Toyota is banking on the idea that customers will appreciate the priority of their safety in this decision."